Ever wanted a cider press and grinder but felt like they were too expensive? Too bulky? Not anymore! Modeled after our most top model, the Pioneer is a great unit for 1- 5 apple trees. Get the same great results as the larger unit! 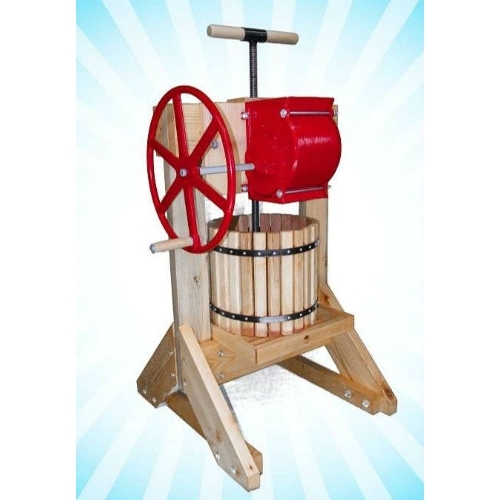 The Pioneer Cider Press & Grinder can press half a bushel of whole apples at a time! No wasted time peeling or cutting apples! Presses about 1-2 gallons per tub of pulp. No peeling or cutting apples; the grinder handles that! Made from high quality Fir and requires very little assembly. Features a 1" Acme screw and 12lbs flywheel! Comes unfinished but with EZ-DO polyurethane for finishing. High quality press and grinder that will last your family for generations to come. Comes with one pressing bag! Order an extra today and save!